Another Monday - another sketch from MJ at TechnoStamper. I grabbed some of my new stamps to create with this weeks sketch - it's an easy sketch that can be used with many different stamps. 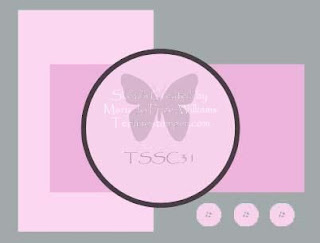 If you'd like to play along, just leave a link to your card on this post, or upload your cards to SCS using keyword TSSC31. 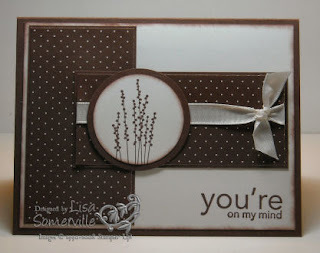 On both of my cards, I used a sentiment in place of the buttons. Lisa! These are gorgeous! Oh my I will be casing the upsy daisy one for sure as soon as I get my order. Great colors, just beautiful. Thanks so much for playing. Beautiful cards, Lisa. Gotta case #1 for sure. TFS! 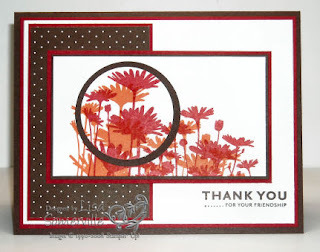 Great cards Lisa, I love these new floral sets, they are my favorites in the new catty! Beautiful Lisa! I love the upsy daisy one. The spotlighting is a great interpretation of the sketch and I love the two toned look you created for the silhouettes. Simply stunning! Yep yep yep, just FAB!, and I'll be a caser too! oh Lisa! You are truly an INSPIRATION! These are lovely! PULCHRITUDINOUS! Awesome cards, as always! THanks for sharing them with us. These are absolutely gorgeous! This is one of my favorite blogs! Your talent is incredible! Thanks for sharing! Beautiful cards, love the colors. I just got both those sets yesterday and feel a case coming on so I have something immediately to ohhh and ahhh over! Thanks for the inspiration. Both cards are so pretty. You did a wonderful job. I love the pictures of your boys. My son is 15, and the same height as his father. He changed pants sizes three times last winter alone. You are right it goes too fast. Keep you the great work. I have enjoyed your blog.